An unaltered photocopy of your WD AGO 53-55 or other military issued document clearly displaying your award of the American Defense. The American Defense Service Medal was awarded for service in the Armed Forces between September 8, 1939, and December 7, 1941. Army members had to serve 12 months to be eligible, but Navy and Marine Corps members were eligible based on any length of service. The American Defense Service Medal was worn by Army personnel after the Army of Occupation of Germany Medal and before the American Campaign Medal (for members of the Women's Army Corps, after the Women's Army Corps Service Medal and before the American Campaign Medal). It was worn by Navy and Marine Corps personnel after the China Service Medal and before the American Campaign Medal. Issued by the Army for service outside the continental limits of the United States, including service in Alaska, as a member of the crew of a vessel sailing ocean waters, or an aircraft making flights over ocean water, or as a member of an organization assigned outside the continental limits of the United States. 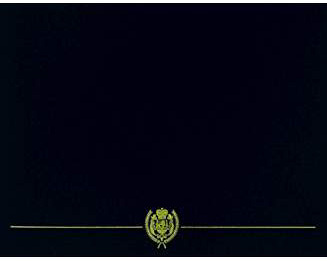 Issued by the Navy and Marine Corps for service ashore outside the continental limits of the United States (service in either Alaska or Hawaii qualified). FLEET Issued by the Navy, Marine Corps and Coast Guard for service on the high seas while regularly attached to any vessels of the Atlantic, Pacific, or Asiatic fleets, to include vessels of the Naval Transport Service and vessels operating directly under the Chief of Naval Operations. Issued by the Coast Guard for all other vessels (that is, those not qualifying for the FLEET bar), operating on the high seas under a regularly assigned commanding officer, including aircraft making regular patrols at sea. Bronze letter "A" (Atlantic): For military personnel who served on board vessels operating in actual or potential belligerent contact with Axis Forces in the Atlantic Ocean between June 22 and December 7, 1941. The first recipient of the American Defense Service Service Medal is not known. In the center of a bronze medallion one and a quarter inches in diameter, a female Grecian figure is shown holding an ancient war shield and brandishing a sword above her head. She is standing on a tree branch which has four leaves. Above the figure, and following the contour of the medal, are the words AMERICAN DEFENSE. The Grecian figure is Columbia, representing America, who is standing in an attitude of defense which is further indicated by the manner in which she is holding her sword. She is standing on a live oak, which represents strength, and the four leaves allude to the components of the armed forces at that time: the Army, Navy, Marine Corps and Coast Guard. The words describe what the medal commemorates. In a bronze medallion one and a quarter inches in diameter, the inscription FOR SERVICE DURING THE LIMITED EMERGENCY PROCLAIMED BY THE PRESIDENT ON 8 SEPTEMBER 1939 OR DURING THE UNLIMITED EMERGENCY PROCLAIMED BY THE PRESIDENT ON 27 MAY 1941. At the base of the medal, and below this inscription, is a seven-leafed spray of laurel. The inscription defines the service for which the medal was issued, and the laurel represents achievement. The ribbon, designed by Arthur E. DuBois, is a field of gold which represents the "golden opportunity" of the youth of America to serve the National colors, which are represented by the blue, white and red pinstripes inside each edge of the ribbon. (2) Naval Reserve personnel on training duty under orders must have served at least 10 days in such duty. Person ordered to active duty for physical examination and subsequently disqualified are not entitled to this award. Reserve officers ordered to ships of the fleet for training duty (cruise) and officers serving on board ships for temporary additional duty from shore stations are not considered "regularly attached" and are not entitled to the fleet clasp. (3) A service clasp, "Fleet" or "Base," is authorized to be worn on the ribbon of the medal by each person who performed duties as set forth below. No person is entitled to more than one such clasp. (4) A bronze star, three-sixteenths of an inch in diameter, will be worn on the service ribbon in lieu of any clasp authorized. (5) Navy, Marine Corps, and Coast Guard personnel, who served on the following vessels operating in actual or potential belligerent contact with the Axis forces in the Atlantic Ocean between the dates set below the ship in the table below are authorized to wear upon the American Defense Service Medal service ribbon, a bronze letter "A" in lieu of the bronze star. Such letter shall be one-fourth inch in height and shall be worn centered on the ribbon. When the "A" is worn, no star shall be worn upon the ribbon (Executive Order No. 8808 of 28 June 1941; Navy Department General Order No. 172 of 20 April 1942). 1. Description: The bronze medal is 1 inches in width. On the obverse is a female Grecian figure symbolic of defense, holding in her sinister hand an ancient war shield in reverse and her dexter hand brandishing a sword above her head, and standing upon a conventionalized oak branch with four leaves. Around the top is the lettering "AMERICAN DEFENSE". On the reverse is the wording "FOR SERVICE DURING THE LIMITED EMERGENCY PROCLAIMED BY THE PRESIDENT ON SEPTEMBER 8,1939 OR DURING THE UNLIMITED EMERGENCY PROCLAIMED BY THE PRESIDENT ON MAY 27,1941" above a seven-leafed spray of laurel. The foreign service clasp is a Bronze bar 1/8 inch in width and 1-1/2 inches in length with the words "FOREIGN SERVICE", with a star at each end of the inscription. The foreign service clasp is placed on the suspension ribbon of the medal. 2. Ribbon: The ribbon is 1 3/8 inches wide and consists of the following stripes: 3/16 inch golden yellow 67104; 1/8 inch triparted old glory blue 67178; white 67101; and scarlet 67111; center > inch golden yellow; 1/8 inch triparted scarlet; white; and old glory blue 67178; and 3/16 inch golden yellow. 3. Criteria: The American Defense Service Medal was awarded to personnel for active duty service from 8 September 1939 to 7 December 1941 for a period of twelve months or longer. a. Medal (regular size): MIL-DTL-3943/228. Medal set with full size medal and ribbon bar. NSN: 8455-00-269-5780.
b. Medal (miniature): MIL-DTL-3943/228. Available commercially. c. Ribbon: MIL-DTL-11589/10. NSN: 8455-00-257-0513. Available commercially. d. Foreign Service Clasp: MIL-R-41819/9. NSN: 8455-00-249-0187. 5. Background: a. 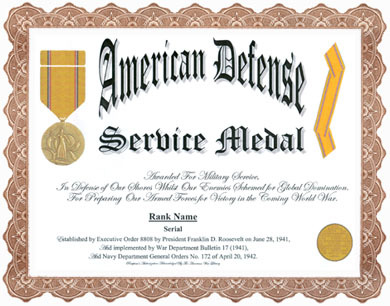 The American Defense Service Medal was established per Executive Order 8808, dated 28 June 1941, by President Franklin D. Roosevelt and announced in War Department Bulletin 17, 1941. The criteria was announced in Department of the Army Circular 44, dated 13 February 1942.
b. The ribbon design was approved by the Secretary of War and the Secretary of Navy on January 7, 1942. The golden yellow color was symbolic of the golden opportunity of the youth of the United States to serve the National colors, represented by the blue, white and red pin stripes on each side. c. The medal was designed by Mr. Lee Lawrie, a civilian sculptor from Easton, Maryland. The model was approved by the Commission of Fine Arts on May 5, 1942.
d. The foreign service clasp is worn on the suspension ribbon to indicate service outside the Continental United States. A bronze star is worn on the service ribbon in lieu of the foreign service clasp.